We name things that draw together. We marvel at the capacity of things to move in coordination—and watch in awe at the sudden emergence of collective movement. 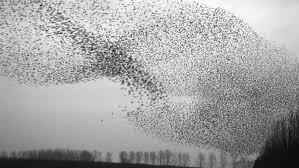 Consider a murmuration of starlings undulating in flight across the sky. These astonishing aerial ballets of up to several million birds, appear at dusk after a day of feeding in small groups and swirl in great displays across the sky. from the linked URL:lovethesepics. Enjoy the full spectrum of images. What scientists understand about starlings is also what we need to understand about ourselves: that the ability to morph from individualism and small group action into collective, coordinated, and mass scale action is key to survival. Now. Today. When we join as one great corpus, we protect the whole. We have work to do! There are students and teachers we need to stand alongside. There are politicians that need confronting and new voices that need election. There is corruption that needs routing out and integrity that needs celebrating. It’s overwhelming—unless we follow the practices of starlings. So first gather six or seven folks and empower one another: read and watch and talk together, practice taking actions, communicate outwardly. Hold onto one another. Then with your small group join the next larger thing happening around you: where do you stand and with whom do you stand? This is the power of great marches: a sense of safety when moving in tens, or hundreds, of thousands in peaceful demonstration; occupying space, linking arms, singing the revolution into being. Is danger present? May someone get hurt? Even killed? Yes. It is always so. AND YET—the collective survives. It is also believed that there is an exchange of information going on about good feeding grounds for the next day. By acting in coordination, we leave messages, stories, maps,–evidence of our flight and fight, in these times when we rise together—a mummeration of starlings becomes an urgency of citizens. On March 14, at 10:00 AM in every time-zone all across the United States, students and teachers are invited to stop in the middle of the school day and observe 17 minutes of walkout to honor the 17 students and teachers who were killed on February 14 in Parkland, FL. Not a student or teacher? Join the larger flock: become an ally: stand at the edge of school property and show community support. Call school administrations and make sure they are not disciplining students or faculty for taking part. Talk to colleges and universities and make sure they are supporting student activism that shows up on incoming freshman essays. Find out of your representatives are taking money from the NRA—and join the defunding of the hawks. 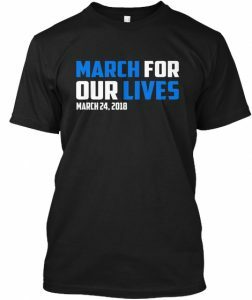 If you’re anywhere near Washington DC on March 24, join the March for our Lives, organized by survivor students from Parkland. Find out what’s happening in your region. Flock, flock, flock—the mummeration is urgent! Roost for the night when you need to: rise with the morning light and include resistance and persistence in your daily life. Great article, Christina! Love the starling murmuration analogy. Flying strong in your flock! I am sending this to everyone I know; my daughter’s nieces attend Parkland and spent harrowing hours, lost people they love and are living with the residue of our failure to convince those in power about runaway gun craziness. Though I have always been for gun limits, now my activism has increased ten-fold. Thank you for your wisdom about how to move together toward sense and intelligent policy and toward standing with those who move in love rather than fear. Ah dear Ruth, you are doing such fine work embedded in the South… find your flock of bluebirds and carry on with heart. I do believe this is a tipping point if we stand up and tip it! A moving call to action! I will open the evening with your blog. Thank you for helping us flock together. Thank you Jeanne–for helping all who read this blog see how a small flock might gather. Thank you for using the mummeration as an example! I think that it’s the only way that we are going to get anywhere at this time in history! yes, the birds do not concern themselves with whether or not they are “effective” or winning or whatever–they just gather and do it. Thank you for this potent message, dear Christina. I will be in the DC area Mar 24 and plan to be out on the Mall with all of the flocks, big and small. Hope I can convince my brother and 13 yr old niece to fly with me. Blessings on all you do. You are like Forrest Gump–always showing up at the right place at the right time to be in a hinge of history! So glad we will have direct witness and report back. Safe journey. E’s middle school didn’t participate yesterday. But he and friends did. The school didn’t collectively participate. Technically, the school didn’t punish. E told me that one of the VP’s “was really grumpy.” It made for really helpful conversation with E and me about why. About taking stands. In his class that he walked from, his teacher had used the circumstance to engage a bit of inquiry. “Write on a piece of paper if you are participating, yes, or no. If yes, do you have questions? If not, do you have questions.” I’ll share murmurations with E. I walked out from where I was, to join in spirit. Thanks for your words and heart Christina. Have T-shirt and marching in Everett at 1:00 at 3000 Rockefeller Ave. Snohomish County Plaza & Amphitheater.